It's a new episode of TORT. I know, weird, right? 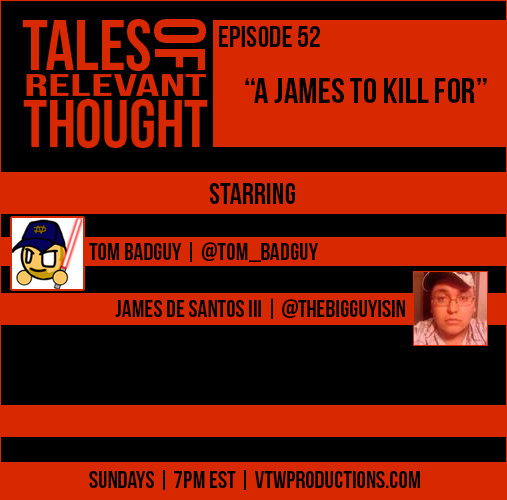 Tom Badguy and guest James De Santos III talk about why this show continues to be inconsistent. Also, conversations about the Zoe Quinn debacle, Guardians of the Galaxy, GTA V heists, and we even give Wayne a call. And, the TORT boys call out the VTW community due to the horrible results of the TORT contest. Enjoy and maybe we'll do this again. I wanted to hear your opinions on the current batch of new nintendo crossovers with Hyrule Warriors, Pokken and Zelda DLC for Mario Kart 8 - Is it Nintendo being creative with their IP or simply running out of ideas? - Also, when I saw an image of that Zoe Quinn chick, I had to agree she's moderately hot. Thanks, man. We didn't pull off an ep last week, but we will definitely try this week. And if so, we'll talk about what you brought! Thanks for listening!